The Enforex Playa del Carmen is situated in the perfect location for students that enjoy the beach as the language school is just a short stroll from a beautiful sandy beach. Below you can find out more about these options, observe course details and read the student reviews. Use the green button at the bottom of the page to book a course at Enforex Playa del Carmen. School info: Comfortable learning facilities, spacious and airy rooms, Caribbean atmosphere, conference room, DVD, TV, volleyball court of sand, small café onsite. 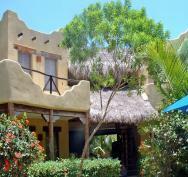 Situation: Located in the large but quiet coastal city of Playa del Carmen near many popular tourist destinations. If you are after a Caribbean atmosphere whilst you study then the Enforex Playa del Carmen is the language school for you. There are beautiful tropical gardens where classes are held underneath quaint thatched roofs. The school has 15 spacious classrooms with the option of 5 extra in the high season when the school is especially busy. There is a conference room containing a TV, DVD, VCR and a stereo. A library room which houses 4 computers all with internet connection and there is also a wireless internet connection available so students can use their own laptops if they prefer. A cafe is also situated at the language school and there is even a sand volleyball court available for students to use. The minimum age for enrolment is 16 without a guardian and 14 with a guardian. Spanish courses include intensive, super intensive, private lessons and also Spanish combined with dance lessons. The intensive course includes 6 varying levels 2 beginners, 2 intermediate and 2 advanced. These classes consist of the maximum of 7 students and the minimum of 3.